So #4 is not even possible. I mean, I travel for a living and then blog about it. How sweet is that? 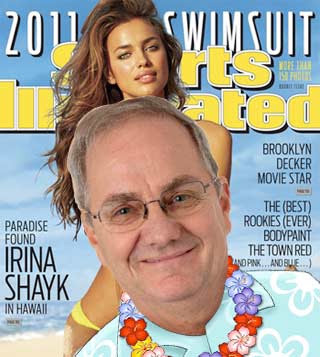 I guess the guys who shoot the Sports Illustrated Swimsuit Edition could claim to have a better gig than I do, but I bet some of those models are not as sweet to work with as they appear to be in print. Can you say Diva? And the ship has pretty much sailed on #3. The other three, obviously, are non-starters. Like I said, I travel for a living. Eating, drinking, and not getting enough exercise are pretty much part of the job description. But the other thing about resolutions, which I have always secretly suspected, is that they may even be bad for you in all of the ways you want to them to be good for you. For example, setting a goal to lose 25 lbs. is not only monumentally hard, it creates a situation where a failure will likely lead to more weight gain. Sound familiar? Well there appears to be some science behind it, as discussed in this recent WebMD article. By the way, I've stopped going to the doctor entirely since discovering WebMD about a year ago. Yeah, I totally self-diagnose everything now, and then jump on Internet discussion boards for treatment ideas. And while crowd-sourcing my healthcare to a bunch of strangers on the web sounds like a recipe for disaster, it's worked so far, and I am saving a ton of money. Your results may vary, and side effects may include extreme agony, followed by a long, slow death. So what are we supposed to do about these things we wish to change about ourselves? Just give up and accept them? I don't think so. I think what the good doctor who wrote that article is saying, is that we need to set our goals more realistically, based upon things we know we can accomplish. He gives the example of marathon runners. The only reason they run marathons is for the feeling they get when they finish. The other 2-4 hours are absolute misery that only a masochist could enjoy. But they didn't start by running 26.2 miles, any more than you would teach your child to read by tossing "War and Peace" into the crib with her at night. I met a fellow who is in his seventies who runs marathons, and he started by running the distance between two telephone poles. That's only 50 feet in most neighborhoods. But that is as far as he could run, and did not want fail (and thus give up). And while it took him several years to get to the point of running his first marathon, he never stopped making progress along the way. In other words, small, attainable, incremental goals. Now I am not qualified to tell you how to cut down on your drinking or eating. But there is an area I do know a thing or two about that you may consider if you are still in the market for a resolution: take more vacation! That's right, you need more time off. Americans work more hours than people in just about every other industrialized nation, and take less time off. In fact, many people actually lose their vacation days because they expire before they ever use them. This, in my opinion, should be one of the seven deadly sins. It can take the place of acedia, since nobody knows what that means anyway. And maybe, just maybe, you could nibble away at that "getting fit" resolution while you are at it. A timeshare rental in a walkable city like New York, San Diego, or San Francisco will incorporate lots of exercise, but in the pursuit of great sight-seeing, shopping, or other tourist attractions. When you return,you might find that throwing some walking into other things you enjoy isn't so terribly difficult (like parking your car really far from the entrance to the mall). Or maybe you could try golf, tennis, yoga, dancing, or swimming at a timeshare resort that offers these amenities on-site. Many have beginner classes with qualified instructors. It's not like joining a gym, and trying to get in shape all at once. Rather, it is introducing yourself to something new, in an enjoyable, low-pressure setting. If you discover you really enjoy one of these activities, it is much more likely that you will want to explore it some more when you get home. What you don't want to do, and I speak from experience here, is go on one of these mancations. Do you know about these things? It's a new phenomenon involving men traveling together, encouraging one another to try extreme sports, physical challenges, and anything involving firearms. Trust me, stick with the yoga and square dancing. You'll thank me later. Alright, I am off to scope out some timeshare adventures for 2012. I am thinking Merry Old England for the Queen's Diamond Jubilee for sure. And if the food is as awful in London as everyone says it is, who knows, I may just lose a few pounds after all. The drinking, probably not so much. Are You Ready for Some... Chicken?